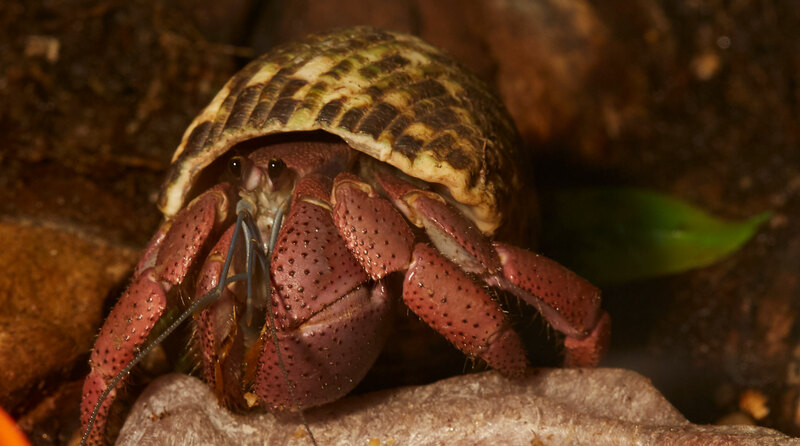 Hermit Crab | Zoo Med Laboratories, Inc.
Hermit Crabs can make fascinating pets that are hardy when kept in the proper conditions. Most Hermit crabs kept as pets are the Atlantic Hermit Crab, also known as the Tree Crab. These crustaceans inhabit coastal areas of Central and South America. They are social creatures that can sometimes be found in very large numbers while scavenging for food at night. Hermit Crabs can grow up to 4 inches and do well as pets when a few basic needs are met. A 10 gallon terrarium is sufficient for up to 6 small (<2″) Hermit Crabs, while larger crabs (3 ½”+) will need a 20 gallon terrarium and can be housed with 3 or 4 crabs. Hermit crabs are social animals; however they should not be crowded when being kept in captivity. Zoo Med’s Naturalistic Terrarium or ReptiHabitat enclosures are a great choice for Hermit Crabs. Daytime Terrarium Temperature 78-83 F.
Nighttime Terrarium Temperature 68-73 F.
Zoo Med’s Hermit Crab Heater is an excellent choice to provide supplemental heat to your Hermit Crabs. Nightlight Red Heat Bulbs are a great choice to provide night time heat and provide just enough light for viewing their interesting nocturnal activities. Hermit Crabs will need a deep layer of substrate to burrow in. We recommend having at least 3″ of substrate throughout half of the enclosure. Mix 2 parts Zoo Med’s Hermit Crab Sand with 1 part Hermit Crab Soil (coconut bedding). This combination will create an ideal layer of substrate that will hold humidity and allow for natural burrowing behaviors. Hermit Crabs are omnivorous scavengers that will eat a wide variety of foods. Zoo Med provides three basic food items that will make up a balanced diet when fed regularly. Zoo Med’s Hermit Crab Food and Fruit Salad are a good choice for daily feedings. We recommend mixing Zoo Med’s Canned Hermit Crab Food with pelleted foods for a well balanced meal. Water is critical to the health and success of keeping Hermit Crabs in captivity. Hermit Crabs have gills similar to those of fish; this adaptation requires high humidity levels in your terrarium (70-90% relative humidity). Spray your Hermit Crab’s enclosure daily. Hermit Crabs will need two different water bowls with constant access to both fresh and saltwater. Zoo Med’s Drinking Water Conditioner should be used for removing chemicals such as Chlorine and Chloramines. Use Zoo Med’s Salt Water Conditioner to turn tap water into saltwater. Provide plenty of climbing branches and a secure lid because Hermit Crabs love to climb! Hermit Crabs will outgrow their shells and are always on the search for their next home. Keeping Hermit Crabs successfully requires keeping several extra shells that are larger than the current shell being used.